Tne best place ESL teachers could´ve found!! 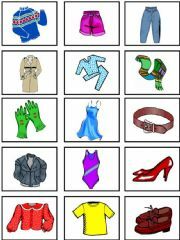 Clothes pictionary. 20 words. Totally editable!! Hope you find it useful!! 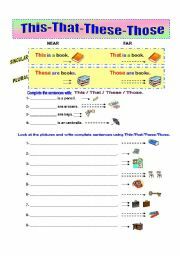 Use this worksheet to explain the grammar rule. Then students get a chance to practice. Hope you find it useful. 21 pairs. School year is almost over in most of the countries. 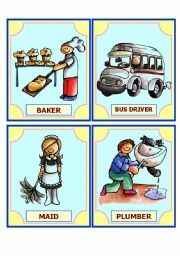 Have students review occupations while having fun, matching pictures with the correct words. Editable. Hope you like them. Have a nice day!! Students practice writing Personal WH- Questions to the answers given on the worksheet. Direct, 3rd. person and Plural. Answer key is included. 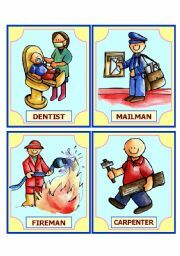 Have your students match the words with the pictures. 20 words. Totally editable!! 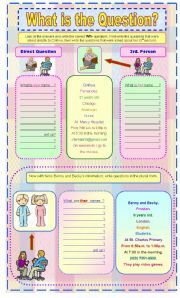 Thank you Jesika for sharing this useful template!! Have a nice weekend!! 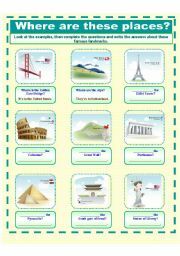 On this worksheet, students practice countries using landmarks. Also they have to write the question using "Where is/ Where are". (examples are given). The activity can be done in pairs for oral practice. Hope you find it useful for your students. HAPPY EASTER TO ALL OF YOU!! Hugs from Mexico!! 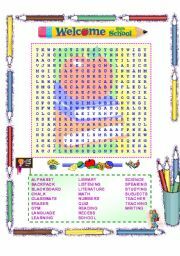 A "Welcome" wordsearch with 25 words related to the topic of going back to school. Nice and entertaining activity to give to your students on their first day of school. Hope you like it. Big hugs from Mexico. 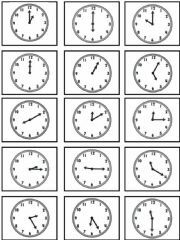 A great idea to practice telling time. Students all age love to practice English while having fun!! Your students will enjoy it. 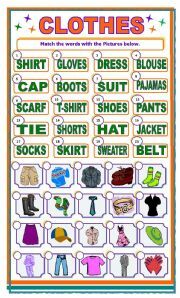 How about playing a memory game to practice clothes? It´s fun and easy. Now you can make extra sets by printing the cards on different color paper. 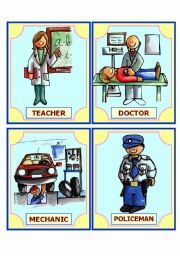 You can also enlarge each picture to make flashcards. 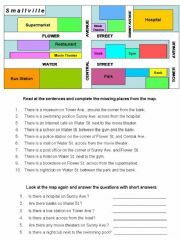 Students first complete the map with places in a city and then answer there is / there are questions with short answers. 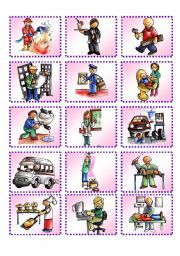 Here are more cards to complete a 30 pairs memory game. 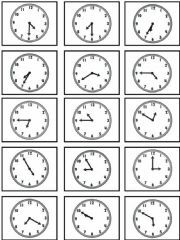 Students practice:o´clock, half past and minutes (past and to). Just print and use as flashcards.